Photo by Rachel Myers for SpeedwayMedia.com. 1. Brad Keselowski: Keselowski won his third consecutive race, emerging victorious at Las Vegas. 2. Kyle Busch: Busch started fourth and finished seventh in the South Point 400. 3. Martin Truex Jr.: Truex finished third at Las Vegas and is now second in the playoff standings. 4. Kevin Harvick: Harvick finished 39th after blowing a tire on Lap 147, which sent him into the wall and into the path of Erik Jones’ No. 20, which rammed Harvick. 5. Kyle Larson: Larson finished second in the South Point 400, getting his Playoffs off to a great start. 6. Kurt Busch: Busch was collected in a late crash and finished 21st at Las Vegas, one lap down. 7. Ryan Blaney: Blaney finished fifth at Las Vegas, posting his sixth top five of the year. He is seventh in the playoff standings. 8. 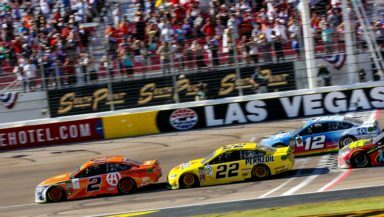 Joey Logano: Logano started second at Las Vegas and finished fourth as Penske Racing teammate Brad Keselowski won his third consecutive race. 9. Aric Almirola: Almirola was the top finisher among Stewart-Haas Racing cars with a sixth in the South Point 400. He is ninth in the playoff standings. 10. Clint Bowyer: Bowyer finished 23rd at Las Vegas.